2. Credit cards: We accept all major credit card payments through our secure payment gateway by CCAvenue. We ship through SpeedPost, FedEx, DHL, UPS and Others. Online tracking is available for all shipments. We deliver within 30 days of confirmation of order. Please note that we are direct manufacturers and although a lot of designs are regularly in production, a lead time of 30 days is required for the hand embroidery & hand process work. Almost all countries impose Custom duties on Products imported in. Please note that the courier companies DHL/UPS/FedEx, through which we send your order are capable of clearing customs & delivering the parcels at your address. Note that any duties and taxes incurred are the responsibility of the recipient and are payable upon receipt of the goods. For information regarding duties and taxes please contact your customs office. Custom Duties charged are not included in the price given & shall be payable by the customer. A. Is this a wholesale site? 1.How can I order from your company? 2. Are these pieces new & fresh? 3. Do you supply in wholesale? 5. What if I want to order a different quantity then as mentioned? 6. What is the area you ship? 7. I want in bulk quantity and I want my own designs at my rates? 9. How quickly do you ship? 11. What are the shipping charges? 12. Do you have a printed catalog? 13. Do you have more designs then as offered? 14. How soon do you update with more designs? 15. I am new to trade and want to start work? 17. When can I call you? Yes, this is a dedicated wholesale site from direct manufacturer from Jaipur India. 1. How can I order from your company? Go through our product catalogues & select the pieces you wish to order. Then Email us the list of product code numbers & quantity you wish to order. We will respond within 24 hours. Yes, all these pieces are being continuously produced with latest designs added frequently. They are fresh Wholesale from Jaipur India. Yes, we are direct manufacturer of Textiles, Home textiles. We supply to wholesale. Our minimum order is a total amount of US$ 300 + shipping. Please contact us by email with your offer. Yes, please contact us directly. Our only condition is that we don't compromise on quality to reduce prices. We accept payment through Credit cards and swift wire transfers in almost all currencies. For information on any other currency different from above please contact us. As soon as you order, we send the pieces for hand work. The shipping is according to the hand work done on the pieces. A shipping date is confirmed at the time you order. We are in Jaipur, INDIA. Due to vast changes in rates according to the country, we prefer giving you the shipping rates when you contact us with the order.Our International shipping charges through SPEED POST is minimum US$ 8.00 for up to one kg. of shipment, then additional US$ 7.00 from every additional kilo for USA, UK, Germany. Minimum charges through UPS is US$ 15.00 for kilo and then additional US$ 15.00 for every kilo. Shipping is confirmed at the time of ordering. No, we do not have any printed catalogue. All our designs packages are online and we keep on adding new designs to them. For separate designs of specific item please email us. Yes, we always have more designs being created regularly. Please email us if you need something specific or more designs. We update our site with new designs every 3 months as per the fashion season. Contact us with your plan, we will be glad to help you in every possible way. Even if you want small quantities you can order . You can contact us by Email or by our telephone number as mentioned in our contact us page. For any urgent business call us any time between 10 A.M. to 10 P.M Indian time. We prefer emails & respond within 24 hours. 18. What are all modes of payment option? * Demand Draft and cheque. We collect information from you when you register on the site, place an order, enter a contest , respond to a survey or communication such as e-mail, or participate in another site feature. We do not sell, trade, or otherwise transfer to outside parties your personally identifiable information unless we provide you with advance notice, except as described below. The term "outside parties" does not include panpaliya.com. It also does not include website hosting partners and other parties who assist us in operating our website, conducting our business, or servicing you, so long as those parties agree to keep this information confidential. We may also release your information when we believe release is appropriate to comply with the law, enforce our site policies, or protect ours or others' rights, property, or safety. To delete all of your online account information from our database, please email us. Please note that we may maintain information about an individual sales transaction in order to service that transaction and for record keeping. Please also go through our Terms & Conditions section below for establishing the use, disclaimers, and limitations of liability governing the use of our website. This site and the materials and products on this site are provided "as is" and without warranties of any kind, whether express or implied. To the fullest extent permissible pursuant to applicable law, panpaliya.com disclaims all warranties, express or implied, including, but not limited to, implied warranties of merchantability and fitness for a particular purpose and non-infringement. panpaliya.com does not represent or warrant that the functions contained in the site will be uninterrupted or error-free, that the defects will be corrected, or that this site or the server that makes the site available are free of viruses or other harmful components. panpaliya.com does not make any warrantees or representations regarding the use of the materials in this site in terms of their correctness, accuracy, adequacy, usefulness, timeliness, reliability or otherwise. Some countries do not permit limitations or exclusions on warranties, so the above limitations may not apply to you. panpaliya.com shall not be liable for any special or consequential damages that result from the use of, or the inability to use, the materials on this site or the performance of the products, even if panpaliya.com has been advised of the possibility of such damages. 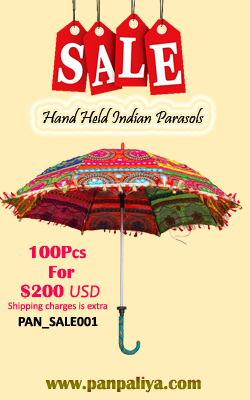 In the event that a panpaliya.com product is mistakenly listed at an incorrect price, panpaliya.com reserves the right to refuse or cancel any orders placed for product listed at the incorrect price. panpaliya.com reserves the right to refuse or cancel any such orders whether or not the order has been confirmed and your credit card charged. These terms and conditions are applicable to you upon your accessing the site and/or completing the registration or shopping process. These terms and conditions, or any part of them, may be terminated by panpaliya.com without notice at any time, for any reason. The provisions relating to Copyrights, Trademark, Disclaimer, Limitation of Liability, Indemnification and Miscellaneous, shall survive any termination. Although due care is taken at the time of taking pictures of any product, but each person views & understand the product differently through a picture. The customer will take due precautions by obtaining full details about the product before ordering. All hand processes including embroideries, prints & other characterizes in producing unique pieces of same designs. This is an inherent quality of the process & shall not be considered as a flaw. Due to high fashion value of our product we do not take back any returns. panpaliya.com may deliver notice to you by means of e-mail, a general notice on the site, or by other reliable method to the address you have provided to panpaliya.com. Your use of this site shall be governed in all respects by the laws of the state of Rajasthan, India., without regard to choice of law provisions, and not by the 1980 U.N. Convention on contracts for the international sale of goods. You agree that jurisdiction over and venue in any legal proceeding directly or indirectly arising out of or relating to this site (including but not limited to the purchase of panpaliya.com products) shall be in the state or federal courts located in Jaipur, India. Any cause of action or claim you may have with respect to the site (including but not limited to the purchase of panpaliya.com products) must be commenced within one (1) year after the claim or cause of action arises. panpaliya.com's failure to insist upon or enforce strict performance of any provision of these terms and conditions shall not be construed as a waiver of any provision or right. Neither the course of conduct between the parties nor trade practice shall act to modify any of these terms and conditions. panpaliya.com may assign its rights and duties under this Agreement to any party at any time without notice to you. Harassment in any manner or form on the site, including via e-mail, chat, or by use of obscene or abusive language, is strictly forbidden. Impersonation of others, including a panpaliya.com or other licensed employee, host, or representative, as well as other members or visitors on the site is prohibited. You may not upload to, distribute, or otherwise publish through the site any content which is libelous, defamatory, obscene, threatening, invasive of privacy or publicity rights, abusive, illegal, or otherwise objectionable which may constitute or encourage a criminal offense, violate the rights of any party or which may otherwise give rise to liability or violate any law. You may not upload commercial content on the site or use the site to solicit others to join or become members of any other commercial online service or other organization. You agree to indemnify, defend, and hold harmless panpaliya.com, its officers, directors, employees, agents, licensors and suppliers (collectively the "Service Providers") from and against all losses, expenses, damages and costs, including reasonable attorneys' fees, resulting from any violation of these terms and conditions or any activity related to your account (including negligent or wrongful conduct) by you or any other person accessing the site using your Internet account. In an attempt to provide increased value to our visitors, panpaliya.com may link to sites operated by third parties. However, even if the third party is affiliated with panpaliya.com, panpaliya.com has no control over these linked sites, all of which have separate privacy and data collection practices, independent of panpaliya.com. These linked sites are only for your convenience and therefore you access them at your own risk. Nonetheless, panpaliya.com seeks to protect the integrity of its web site and the links placed upon it and therefore requests any feedback on not only its own site, but for sites it links to as well (including if a specific link does not work).